Hands-on Dark Souls 3 , Fallout 4 & More from Gamescom 2015! 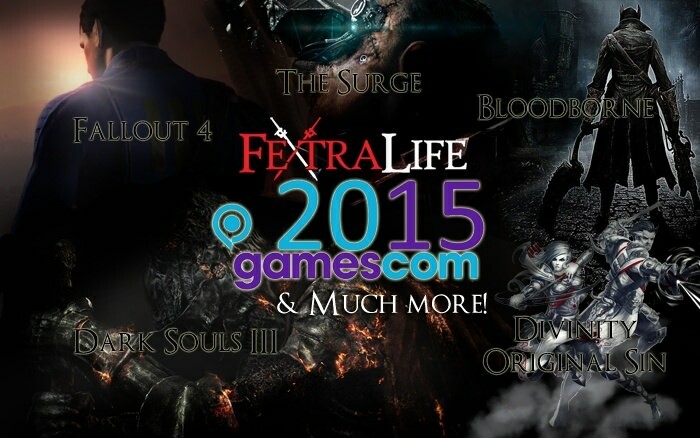 Fextralife is attending Gamescom Press Day and has exclusive content lined up for you! Dark Souls 3: Hands-on demo, closed doors preview, and floor demo! Pictures and gameplay footage incoming #hype! – Check out our E3 Coverage of Dark Souls 3. The Surge: New title from Deck 13! We get an interview with the studio and will bring you as much info as possible for this next-gen RPG! Fallout 4: All and any information about the upcoming Wasteland adventure. Bloodborne: Will anything else on the expansion be revealed at Gamescom? Stay tunned! Horizon Zero Dawn: More information on the new title from Guerrilla? Destiny: New details of updates! There’s of course much more to see at the floor and more content to report on, so stay tunned and let us know what exactly you’d like for us to look for! Make sure to follow us on Twitter, Facebook and Google+ to get quick from-the-floor updates! Depending on who is playing the demo (I think Cas is) the first thing I would like to know is if DkS3 will be weighty like DkS1, or more fluid in movement like DkS2. Why is who is playing the demo important? You mean a Namco rep or us? We’ll get to play. If you or Cas aren’t playing you can’t really get a true feel. Of course it’s important. maybe you can ask them(the fallout guys) when or if they are going to bring paid mods to fallout 4 or not. Modders do not get into modding games to get money they do it as a hobby, also i can not rightly support a company that after 10+ years of letting mods be free suddenly wants money for something they did not make, the mods i mean. We are now in Europe, enjoying some beautiful vistas +jetlag. Fun times! If you guys have specific questions about the games please let us know, we’re looking forward to it! "Bloodborne: Will anything else on the expansion be revealed at Gamescom? Stay tunned!" Yes. I am very "tunned". For real, though, I am. Can’t wait to see what you dig up. Getting ready to ride into Germany! 5 hour train ride… wonder what we’ll do… oh, right, beer! I’m jelly of you guys haha, I’d sell my left kidney to go to Gamescon. Waiting for pics of Ces and Fex with Major Nelson, and to say how awesome the Halo 5 arena demo is. We’ve got a few more previews incoming, hope everyone enjoyed the coverage so far! Next up is Tokyo Game Show… there WILL be DKS proper gameplay and we really hope Bloodborne stuff announced!